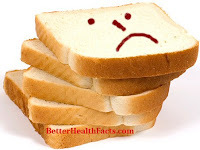 A number of people eat white bread without even knowing its negative impact on their body. Here we have gathered some must-know information for diet conscious people. In whatever form you eat white bread, its negative features (side effects) will affect your body badly. So read more below and you will say goodbye to White Bread. Less Nutrition: Main motive of eating should be good nutrition. If you eat white bread occasionally then its fine, but if you are regular then you are harming yourself. White bread is made up of refined flour, which means no fiber and around 25% less protein. Some brands add Vitamin B and Iron to it to add a label of "Enriched Flour" but the amount of fiber and protein is not increased. Due to this reason a number of people have moved to Whole-Grain Bread or Brown Bread. Increases Blood Sugar Level: Fiber and Protein slows the digestion and get food digested perfectly. But absence of Fiber and Protein in White Bread makes it digested much quicker, thus increasing blood sugar level at a high speed. So if you are diabetic then you have take extra care in choosing the right bread for yourself. If you eat white bread on regular basis then your cells become insulin resistant which makes it harder to control blood sugar. Makes you Fat: As a matter of fact the surplus blood sugar is stored by our body in the form of fat. White bread increases blood sugar much faster and if you don't utilize it, it will get stored on your belly. Apart from that, due to lack of fiber and protein white bread is digested very fast which makes you hungry again, and you will instantly go for some other snack, again increasing your calorie intake. Depression: A research published in June 2015 American Journal of Clinical Nutrition found that over intake of Refined Carbohydrates (just like white bread) can cause depression. It harms more women in post-menopause. Those hormones which are responsible for lowering blood sugar are also responsible for mood swings and some symptoms of depression. You might not be in mood to totally avoid White Bread (as its there in Pizza Base), but you should try to reduce the intake. Is Brown Bread Really Healthy ?